My nephew is turning three the end of the month. Like many boys his age, he's enamored of trucks of all kinds. 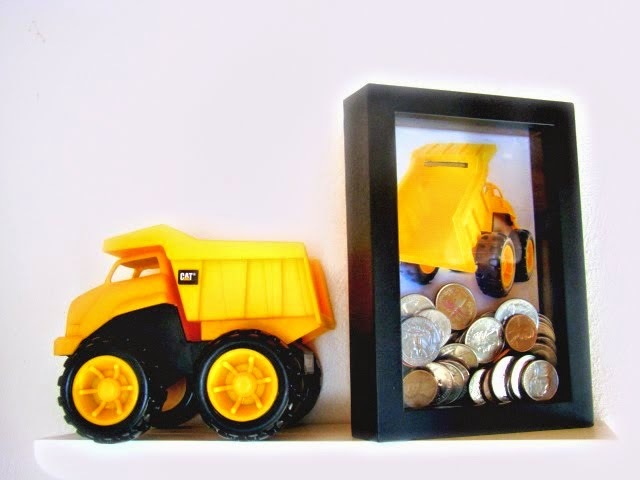 So when I saw this dump truck bank tutorial the other day, I knew I had to make it. Sadly when I looked at Dollar Tree today, they didn't have any shadow boxes, so I'm going to either have to look elsewhere or improvise some sort of substitute. Any ideas? Dollar Tree did have some super cute liquid soap dispensers that looked like real apples, lemons, oranges, and pears. I loved them, but couldn't think of a good excuse to get them.